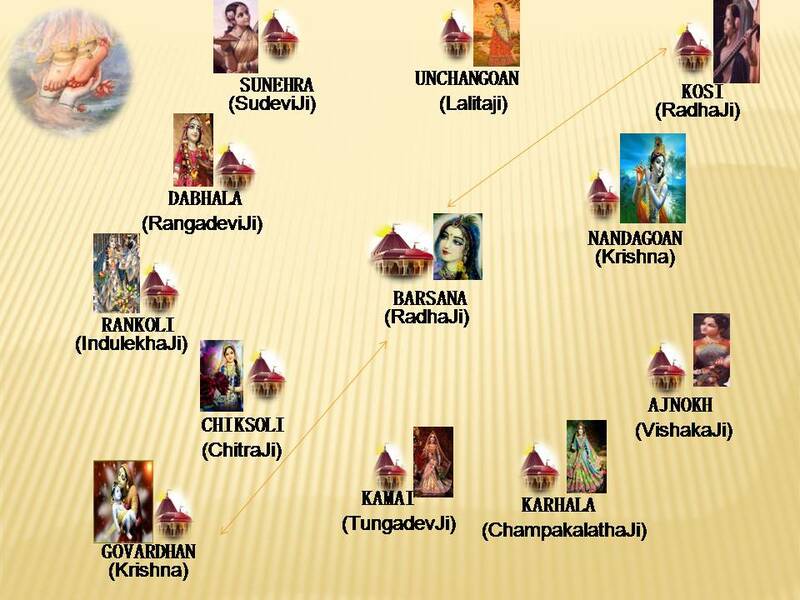 The Puranas states that out of many thousands of gopis, sixteen thousand are predominant and among them 108 gopis are very close , eight are still more prominent Radharani and Candravalli are very prominent and Srimathi Radharani is the most prominent. Because Radharani possesses all the charm and sweetness to attract Lord Krishna . 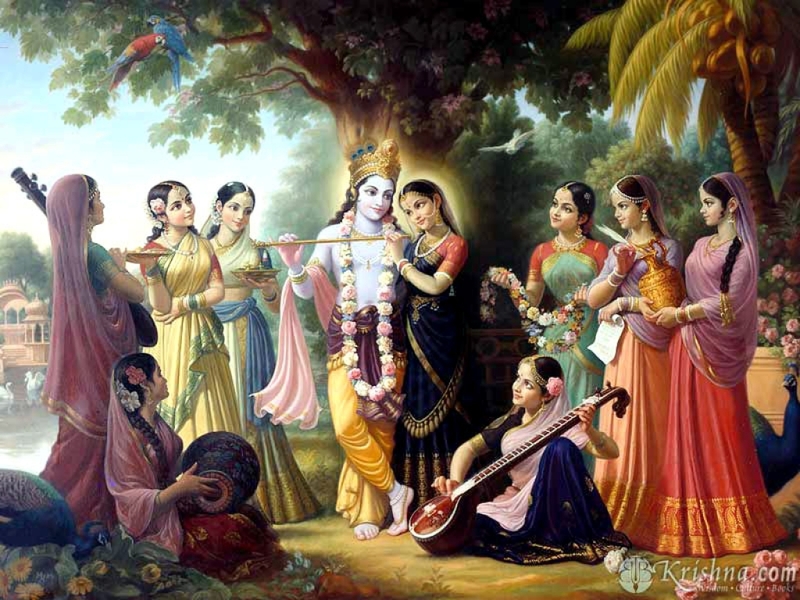 To increase the transcendental ecstasy of Radha and Krishna, the Parama-preshta Gopis show partiality; sometimes they favour Krishna, sometimes Radha. These Eight Gopis are the leaders of all the other gopis. Although these Varishtha Gopis are the leaders of millions of other gopis, because they are very greedy to earn Radha’s love , they always prefer to serve under the command of Radha and try to please her in every way possible. These gopi friends decorate their own dear friend Srimati Radharani and they take Radharani’s side whenever she has a lover’s quarrel with Lord Hari. In most of the temples, in Braj bhoomi, we have darshan of Radharani and Lord Krishna being flanked by two sakhis, Lalitha and Visakha. Among them, Lalithasakhi is the leader and chief of all the Ashta sakhis. 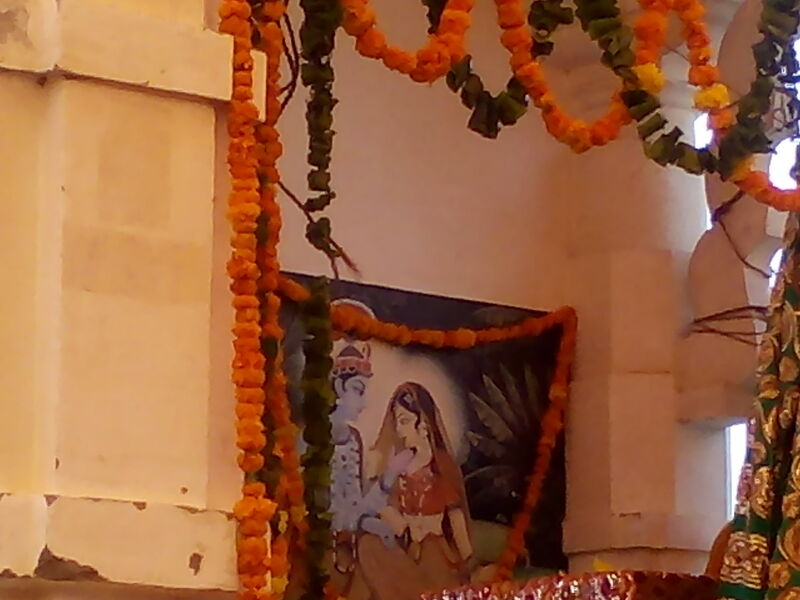 She is the constant loyal companion and follower of Radharani and always takes HER side. Her only desire is to serve RAdha and Krishna always , and Lord KRishna who is bound by bhakti alone, keeps her beside HIM. 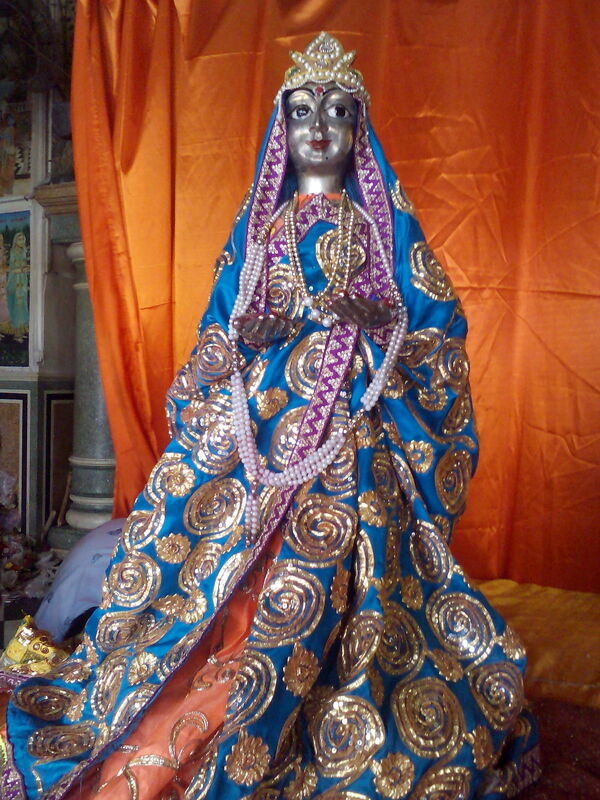 She is elder to Radharani. But as per the prevailing custom, her appearance day is celebrated as “Lalitha Sashti” which occurs two days before Radhashtami. She appeared at a place called Karhela to Visokha and Sarada devi . Her parents later shifted to Ooncha gaon where there is a big temple dedicated to her. Ooncha gaon is 2 kms from Barsaana. But as it was the appearance day of Lalitha sakhi, we were told that abhishekam would start at noon and hence we drove straight to Sunera which is 3 kms beyond Oonchagaon to have darshan of Sudevi and then returned to Ooncha gaon. 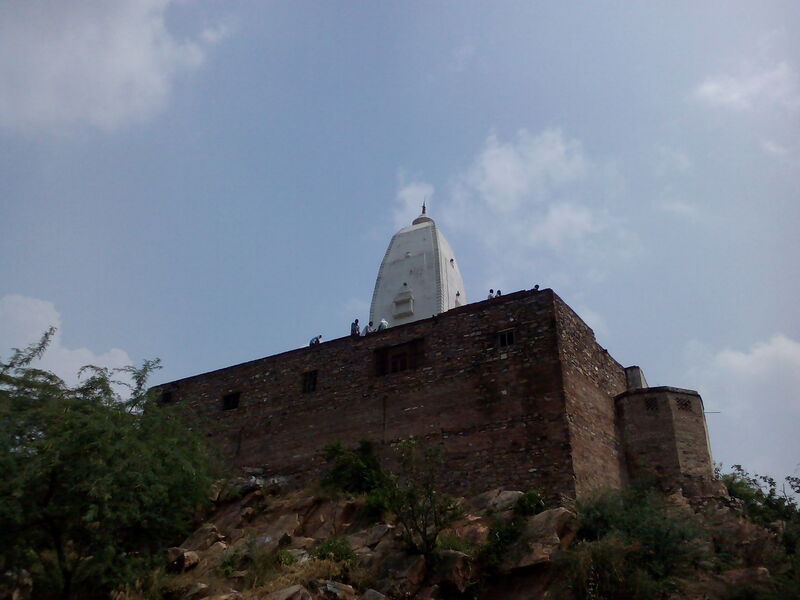 Lalitha sakhi’s temple is situated on a small hillock. The big hall in front of the altar was already crowded with devotees who unmindful of the scorching heat were immersed in bhajans. To have the feel of the transcendental bliss , devotees advise we should first have the grace of Lalitha sakhi, then Giri Goverdhan and River Yamuna. Lalitha sakhi is so merciful that she can read one’s mind longing for Krishna and voluntarily convince and compel Radharani and Krishna to grace the person and ensures that the fallen souls attain Lords’ lotus feet. The great saint Srila Rupa Goswami, one of the shat-goswamis of Vrindavan sought refuge at Lalitha sakhi’s lotus feet to enjoy the Madhurya rasam of Radha and Krishna. The followers of Rupa Goswami, known as Rupanugas, first pray to Lalitha sakhi for her grace. Lalitha sakhi is sharp witted and always immersed in the pastimes of Radha and Krishna. 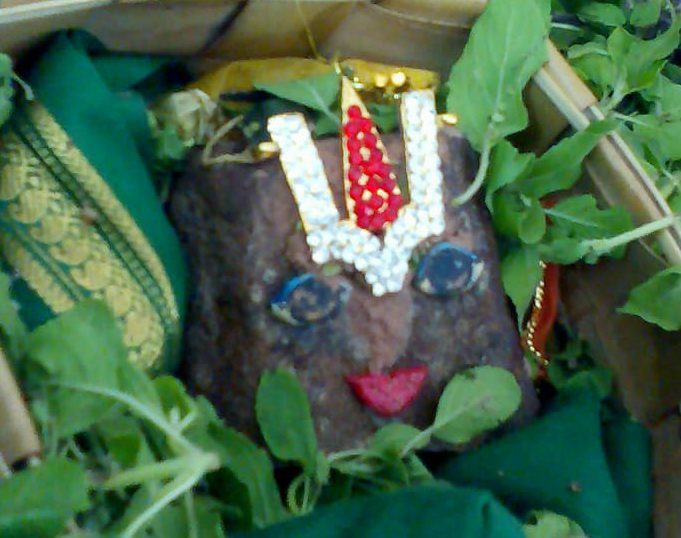 Lalitaji appearance in the village of Karhala where Dadhi Daan (a ritual celebration of Sri Krishna’s appearance involving the throwing of dahi mixed with turmeric) takes place every year. Karhala is considered the navel of Braj. Her appearance day is celebrated grandly. In fact, the appearance days of Radharani and ashta sakhis starts with Lalithaji’s appearance day only . The temple premises was jam packed. Despite the scorching heat, the assembled devotees were doing bhajan and few artistes were performing dance accompanied by songs in Braj language in front of the mandapam where the abhishekam ritual was to be held. Myself and Sri.Rajagopalan were ushered inside and were allotted a place to sit on the dias and watch the abhishekam. 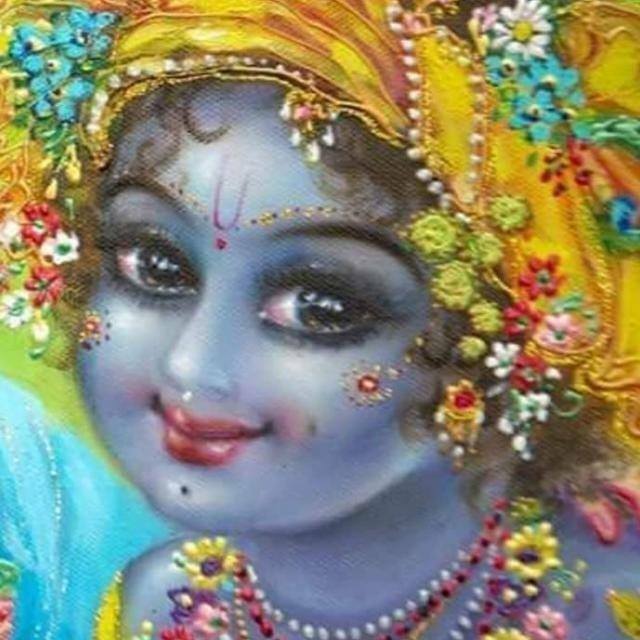 It is a usual practice for everyone to observe fast by not even taking water and were so engrossed in Krishna bhakti and were chanting loudly “Radhey Radhey” . This made me realise and recollect our poorvacharyars craving to be associated with Braj bhoomi. Parasara bhattar, the prominent Srivaishnava acharyar used to lament that he was not born in Braj bhoomi amidst these innocent gopis . Bhoomidevi who appeared as Kodhai(Andal) in Srivilliputtur and was brought up by Periazhwar imagined HER to be one of the gopis of Vraj and did paavai nombu. Such is the greatness of Braj mandal. Every inch vibrates with Krishna bhakti. One has to personally go there to have a feel of this. Unlike South Indian tradition, these pujaris have a different way of performing abhishekam. It is usual practice in South Indian temples to place the dieties on the abhishekam table, offer shodasa upacharams, pour sanctified water, milk,curd,honey etc through conch and adorn the dieties with various garlands. We use sahasradhaara plate to gently give shower to the dieties amidst chanting of pancha sukhtam. But here, the custom is different. At noon, Lalitha devi-the chief of ashta sakhis was brought to the mandapam and a silver vessel was placed on a table . These pujaris who have herditary right assembled together and one of them held the diety above the vessel. A holed mud pot was held above Lalitha sakhi’s head and through it the remaining priests start pouring milk,curd, honey, juice, ghee, butter etc simultaneously. All the people having hereditary rights were given a chance to pour these abhishekam items on her. 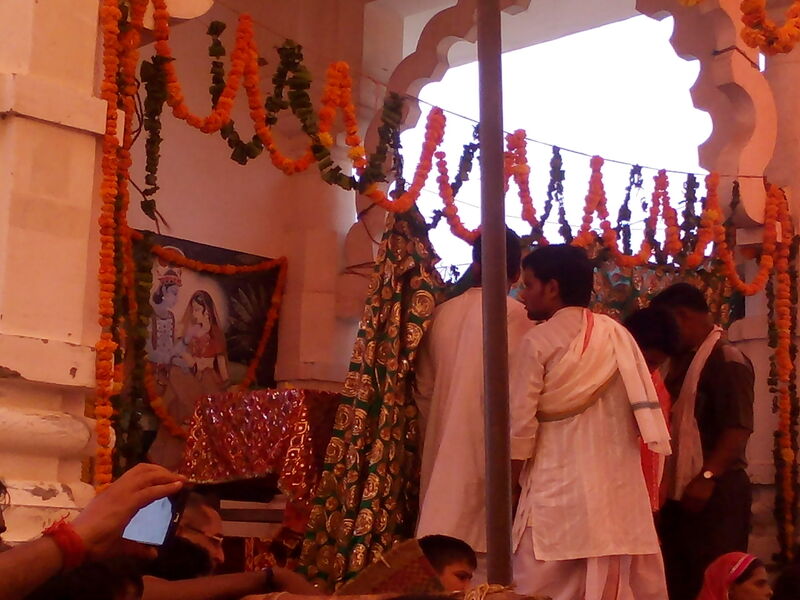 This ritual took place for about 10 to 15 minutes after which the curtains are drawn and the deity was taken inside for decoration. Later chappan bhog is offered to the diety and distributed amongst the devotees. Please accept my humble obeisances from this lowliest of creature. I came to know about AsthaSakhi mandir, transcendental, inconceivable and indescribable Lila that took place at these eternal places. From your posts, pictures and videos, my heart, mind and soul urges fervently to visit these places, all the astha sakhi mandirs and have darshan and take blessing and mercy of all the asthasakis, radharani, shaymasundadr, all the vrajavasis, all vaishnavas, all servants and bhaktas of the lord, all pious human beings ,so that one day I might attain the absolute position and seva at their lotus feet of Sri Radha Krsna. This dancing & enjoying the Bliss of Krishna is only in the North. Real past time activities, we should emulate from these people. It teaches a lot indeed!